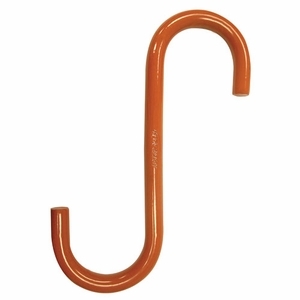 "S" hooks are great for many uses because they have a relatively narrow tip that is easy to insert into a variety of objects, and they also have generous throat openings with no latch kits to fuss with. They are rated lower than most common rigging hooks, but unlike other "S" hooks, these are indeed rated for lifting. They come in a variety of sizes with Working Load Limits (WLL) up to 6,250 lbs. They are made from alloy steel and are proof-tested at 2 times the WLL, and the WLL is embossed on each hook. Orange powder coat finish. Custom sizes and serialization available upon request.